Even if you don’t have an instrument rating you’ll appreciate just how magnificently the system choreographs movements of thousands of planes through a crowded airspace every hour. The United States airspace system is divided into 210 different regions controlled by 21 enroute centers. Each ARTCC works traffic that is enroute between the departure point and destination airport. For example, the Chicago Control Tower, (contrary to what Hollywood wants you to think), controls aircraft from the gate to the end of the departure runway. After the aircraft’s wheels are up, it is switched over to a departure controller. Enroute centers then handle the aircraft in all phases of flight until they get within 40 nautical miles of a destination airport. ZAU is the name of this location (Z designates this as an ARTCC and AU for Aurora). Post 9-11 means that the facility is surrounded by barbed wire with the obligatory security screening (X-Ray and magnetometer) . After some preliminary facts and stats, Sandy, Kathi and Jenna provided an excellent overview of the Center’s operations. I’ll say this: Everyone I met seemed to like what they were doing. Proud to be part of the system. That’s good but better still is that they value skill and experience. Guy said it takes ten years before you really know the job. An hour later, we headed down to the Traffic Management Unit where they explained a little about flow control. This is the art and science of organizing hundreds of flights heading to the same destination with the necessary “miles in trail”. A 120 mile interval might be needed from Miami Center if the Jacksonville Center needed to squeeze two in the gap, making it 60 miles. Down the line, ZTL gets 30, ZID gets 15 until they all arrive ZAU. Mind boggling. After this, a quick overview of the weather briefing facility. Sort of a flight service station for internal use. Then on to the main event: With the same type headset used by controllers (sans mike) Kathi Murphy directed me to the West sector where I plugged in alongside Nick, who was still basking in Super Bowl Glory, in a Green Bay jersey. Aside from that, he was a pretty good guy. A typical radar team consists of a radar controller (R side), who communicates with the pilots, and is responsible for the operation of the sector, and the radar-associate controller, (D or data side) who assists like a co-pilot. When it’s busy, say 17 or more aircraft in a sector, the assistant will man the User Request and Evaluation Tool (URET) a flat panel screen on the right displaying flight plans and identify aircraft that will be in conflict, or need to be rerouted. In fact, the URET eliminates the need for paper strips on blocks which had been in use for years. This evening, there is no need for a team and Nick handles both roles with ease concentrating on the radar panel in front while delivering a rapid fire series of instructions to airline pilots in his high altitude sector (sector 82 IIRC). In between all that activity, Nick patiently explained to me the need for lateral separation of 5 miles and vertical of 2,000 feet (above 29,000 MSL) and demonstrated the need to visualize in three dimensions. Very Quickly. Aircraft are shown as rectangular targets indicating position and a vector line. Alongside are the flight number, assigned altitude, mode c altitude, and ground speed. I was impressed . 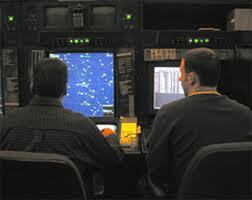 Air traffic controllers also attend training to learn how to talk at 40 knots with occasional gusts to 50. Time went by in a flash and before I could say climb and maintain, I was back in the classroom for debrief and a safety presentation. The four hours were educational and it increased my confidence in the system. Many controllers are also pilots which can be mighty handy for some of us who need a hand. Nice to know they got your six when tooling around in the murk. 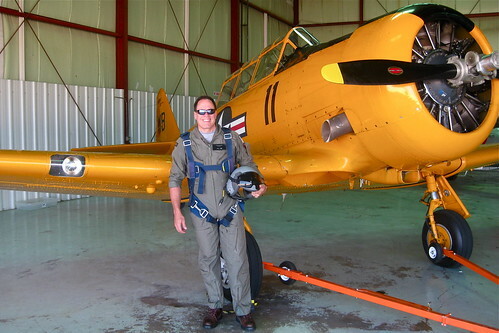 This entry was posted in Commercial Aviation, General Aviation, Training. Bookmark the permalink. Last ATC facility I was in was Paris Control at Thon son nhut (TSN) where a frat. brother who was night shift CO showed me around one night when I was TDY down in Saigon. LOL–a loooonnng time ago. Just like aircraft electronics, I’m sure there’s a BIG diff between today and then–tho not as much as in pvt ac as the govt has so fouled up the modernization process the current system is decades behind, iirc. Thon son nhut? Frat Brother? Night shift ATC? None of these go together but I’m sure that’s another story. The sad thing is we are running crucial facilities like this with antiquated equipment. They still use 486 processor technology. Nice step in the right direction using the URET instead of paper strips but we need to be funding NextGen technology. Funding has been a challenge for the FAA.